In each period (horizontal row), the atomic numbers increase from left to right. The periods are numbered 1 through 7 on the left-hand side of the table. Elements that are in the same period have chemical properties that are not all that similar. Consider the first two members of period 3: sodium (Na) and magnesium (Mg). In reactions, they both tend to lose electrons (after all, they are metals), but sodium loses one electron, while magnesium loses two. Chlorine (Cl), down near the end of the period, tends to gain an electron (it’s a nonmetal). The older method uses Roman numerals and letters. Many chemists prefer and still use this method. The newer method uses the numbers 1 through 18. So why do the elements in the same family have similar properties? You can examine four families on the periodic table and look at the electron configurations for a few elements in each family. The IA family is made up of the alkali metals. In reactions, these elements all tend to lose a single electron. This family contains some important elements, such as sodium (Na) and potassium (K). Both of these elements play an important role in the chemistry of the body and are commonly found in salts. The IIA family is made up of the alkaline earth metals. All these elements tend to lose two electrons. Calcium (Ca) is an important member of the IIA family (you need calcium for healthy teeth and bones). The VIIA family is made up of the halogens. They all tend to gain a single electron in reactions. Important members in the family include chlorine (Cl), used in making table salt and bleach, and iodine (I). 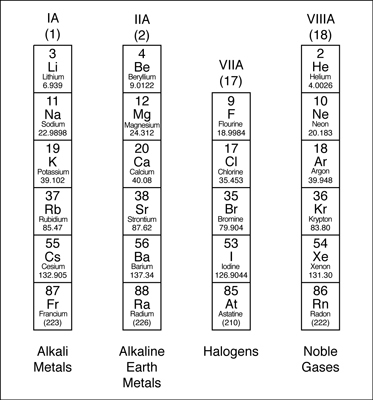 The VIIIA family is made up of the noble gases. These elements are very unreactive. For a long time, the noble gases were called the inert gases, because people thought that these elements wouldn’t react at all. A scientist named Neil Bartlett showed that at least some of the inert gases could be reacted, but they required very special conditions. After Bartlett’s discovery, the gases were then referred to as noble gases. An electron configuration shows the number of electrons in each orbital in a particular atom. These electron configurations show that there are some similarities among each group of elements in terms of their valence electrons. Keep this in mind about the number of valence electrons and the Roman numeral column number: The IA family has 1 valence electron; the IIA family has 2 valence electrons; the VIIA family has 7 valence electrons; and the VIIIA family has 8 valence electrons. So for the families labeled with a Roman numeral and an A, the Roman numeral gives the number of valence electrons. The Roman numeral makes it very easy to determine that oxygen (O) has six valence electrons (it’s in the VIA family), that silicon (Si) has four, and so on. You don’t even have to write the electronic configuration or the energy diagram to determine the number of valence electrons.